good. An extension might be called Moral Double-Entry." Christie Malry is a simple man. Determined to improve his lot by becoming an accountant, he instead uses his new-found understanding of double-entry book-keeping to draw up a reckoning between himself and society at large, placing a value on every wrong done against him with the aim of extracting a similar value back through increasingly extreme means. B.S. Johnson's 1973 novel Christie Malry's Own Double-Entry is a fascinating work on both a narrative and technical level, working as both a novel and an anti-novel, an example of post-modernist literature written long before post-modernism became the creative curse that it is today. Its central concept was straightforward, but is inventively and at times ingeniously handled, while its casual rejection of the moral values of society is both surprising and strangely satisfying. Throughout the story, Johnson draws the reader's attention to the fact that we are reading a novel, and in one chapter engages in direct dialogue with his lead character about the nature of the narrative he is participating in. Anyone attempting to make a film of such a work, one that is going to connect with an audience and affect them on an emotional and intellectual level, is taking on one hell of a challenge. That screenwriter Simon Bent and director Paul Tickell took on this task is admirable, and that they didn't completely nail it is simultaneously unsurprising and a little disappointing. But they have still created a film that intermittently captures the anarchic spirit of the novel and that is still a very worthy and sometimes satisfying work. That it has, however, remained largely unseen in the very country in which it was created is more than a little dispiriting. So what happened here? Why was this BAFTA-nominated film not more widely released and seen? I mean, how many inventive, original British features actually appear each year? And when one does come along, why is it almost immediately buried? Well there are a number of reasons, none of which cut any ice with me. The novel itself, though acclaimed and recognised as an important work, is not as widely known nowadays as it probably should be, and is hardly going to find itself on the GCSE English reading list. No instant tie-in hook there, then. And then there is the character of Christie himself. He's a million miles from the do-good heroes of the Hollywood mainstream, a man who effectively declares war on society and quickly graduates from small-time vandalism to mass murder. Christie is an amoral domestic terrorist who destroys not for political or ideological reasons, but to balance his reckoning with anyone he has issues with, which would probably include a sizeable proportion of any potential audience. Starting to see the problem? Well there's more. Having completed the film, the filmmakers were having trouble nailing a distribution deal, and some months later it still had not made its way into UK cinemas. Then on September 11th 2001, the World Trade Centre attacks transformed western attitudes to terrorism of any sort, and no-one wanted to touch the film. It was to be almost another year before Christie Malry was to get it's overdue cinema release, and even then it was pulled after only a few screenings. It eventually crept out on DVD, virtually unnoticed and at a budget price. This is all wrong. I may have issues with certain aspects of the film (and the DVD, as it happens), but it's still a classily made, often inventive, and in many ways unique work that has one thing most recent British and American movies tragically lack: it has balls. The traditional route to audience identification of creating a sympathetic lead character really wasn't open to the filmmakers here. Malry is an urban terrorist with essentially selfish motives, but screenwriters Simon Bent and Paul Tickell have recognised up front that a character does not necessarily have to be likable to be interesting, and Christie is certainly that. Shrugging off the book's own pre-post-modernist style, director Tickell adopts a very formal approach, a mixture of carefully composed, locked-down compositions, smoothly executed tracks and eye-catching top shots. This gives the film a very observational feel and creates a reality that is also a little unreal, something reflected in the non-naturalistic but still engaging performances. Nick Moran plays Christie as a man who is two steps away from grounded reality, an ordinary bloke who has been slowed down to 33rpm. He perhaps takes Johnson's description of him as "a simple man" a little too literally, but still nicely underplays a part that could so easily have been camped up. When he tells girlfriend Carol (referred to simply as The Shrike in the novel) that he loves her, for example, there is an almost comic edge to his vocal delivery, one underscored by an oddly convincing sincerity. We never get really close to Christie, but the nature of his quest and his own moral ambiguity keep him at just the right distance for an audience to find interesting and not feel betrayed by his actions or behaviour. It is to the filmmakers' considerable credit that they have been largely faithful to the novel, which can't have been an easy sell when trying to raise the budget, and the film is at its strongest when it adheres to Johnson's vision. This goes beyond the recognition factor of seeing something you admire in print being reproduced faithfully on screen; for evidence of this, you only have to look at the scenes that were not in the novel, which for the most part simply do not measure up. The most glaring example is the attempt to expand on the novel's intermittent quotes from Fra Luca Bartolomeo Pacioli (the Benedictine monk who, in his 1494 work Suma de Arithmetica Geometria Proportioni et Proportionalita, was the first to be credited with devising a system of double-entry book-keeping) by intercutting Christie's story with a series of extended fifteenth-century flashbacks detailing Pacioli's relationship with Leonardo Da Vinci. Lushly photographed and sincerely performed, they may well tell an interesting tale in themselves, but it isn't half as interesting as the one being told about Christie in modern times. And broken up into small segments which have only a minimal link to the main story, they are difficult to engage with on more than a superficial level, acting as interruptions to the real meat of the film. Without these flashbacks, which have the content, character and tone of a more traditional historical drama, Christie Malry's Own Double-Entry would come close to anarchist cinema, (largely) refusing to pass judgment on its protagonist and genuinely fascinated and at times almost delighted by his actions. For a conservative audience this will definitely pose a problem, but for those of us depressed by the twee Britishness of the likes of Notting Hill, Love Actually or Wimbledon and the like, such an approach is genuinely liberating. There is a purity to Johnson's vision of Malry's odyssey that makes the story work as well as it does. Though the film-makers have largely adhered to this approach, they have added the suggestion, confirmed by the commentary track, that Christie is also irresistibly drawn to the sound of breaking glass, supposedly triggered by the noise a bottle being smashed during his conception. This can't help but dilute the single-minded simplicity of Christie's purpose, suggesting that rather than making a deliberate decision, he is in fact responding to an unconscious need that has been with him since birth. This also gives rise to one of those scenes that always get my back up, where a song on the soundtrack spells out what his happening on screen – as Christie blows up a tax office, we are treated to a (rather good, it has to be said) version of 'I Love the Sound of Breaking Glass', which is followed with an on-screen hailstorm of, yes, broken glass. This is a real shame, as elsewhere Luke Haines' simple but haunting score is most effectively used. Spoiler alert: If you don't want advance information on scenes towards the end, and the end itself, skip past this section by clicking here. It's after this that the cracks really start to show and the inventiveness and originality begin to slip. A scene in which Christie's mother and his workmate Headlam turn up in a bar to play Angel and Devil and rather obviously debate the morality of Christie's actions is clunky and unnecessary, and the pub revolutionaries, who were represented only by their dialogue in the book, stretch the concept of cartoon characterisation a little too far. A bigger problem, especially for those who know the novel, is how the story concludes (last chance to bail out!). In Johnson's original, Christie discovers a lump which is diagnosed as cancer, which very rapidly brings his life to an end (in a chapter ironically titled 'Now Christie really does have Everything'), a event whose random nature he is unable to build into his reckoning and results in him ultimately canceling his debt. In the film he is blown up by one of his own bombs on the way to destroying the Houses of Parliament, a twist that can't help but seem contrived and judgemental – he who lives by the bomb, dies by the bomb. It almost feels designed to provide a sense of poetic justice for those who regard Christy's actions as unforgiveable, deflating the film's previously potent sense of liberation and moral ambiguity. This is followed by a funeral that seems to mock Christie's antipathy towards religion, and a completely unnecessary and horribly misjudged scene in which his girlfriend Carol discovers Christie's ledger and his drawings and plans, a scene made all the more unpalatable by a cheesy round-up montage of earlier scenes. All of which is a huge shame, as together with the distracting trips back to the fifteenth century, this cuts an intriguing and sometimes brave piece of work off at the knees. But I would still suggest that the bits that do work are a lot more inventive, interesting and chance-taking than most other recent British films are in their entirety. The sense refreshingly amoral anarchy survives largely intact, and the technical handling is often very impressive, repeatedly belying the film's small budget. The film, like Johnson's story, appeals to that dark little part of us that, after a day of being repeatedly wound up by the thoughtless idiots, wants to go nuts in a supermarket with a tommy gun. 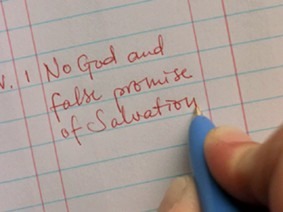 And I've personally got a soft spot for any film in which the lead character cheerily dismisses the church as corrupt and deceptive, and reasons that he is owed recompense by society because of "No God and false promise of salvation." In some ways this is a very good transfer. Colours are strong, sharpness is good and black levels are generally spot on. There is minor artefacting in areas of one colour in places, but it is rare. The problem is that we have not the anamorphic widescreen print the film demands, but a cropped 4:3 one, which really does mess with Reinier van Brummelen's handsome photographic compositions. To make matters worse, the opening credits are in non-anamorphic 1.85:1. Thus, despite a decent selection of extras, there is a sense of a half-arsed job here that director Tickell should complain bitterly about. The soundtrack is Dolby 2.0 stereo, but the separation is often very good and the tonal range excellent. If you have DSP modes on your amp, re-channel the bass through the subwoofer and you get some kick-arse low frequencies in places. 5.1 would have been nice, of course, but as Dolby 2.0 tracks go, this is a good 'un. Considering this disk can be picked up for about a fiver and the picture has been cropped, the number of extras on offer here is genuinely surprising. 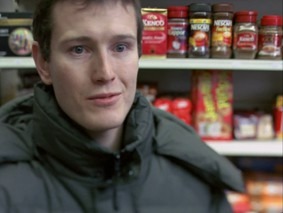 The first is the best, a screen-specific commentary with director Paul Tickell and lead actor Nick Moran, though neither are identified by name on either the menu or the track itself. (The DVD case misleadingly suggests that there are two seperate commentaries.) This is an informative and sometimes entertaining listen, giving plenty of background on the making of the film, and certainly answered some questions I had about how they obtained permission to film a scene in which Christie poisons the water supply at a real water processing plant. There are, however, a couple of technical issues. Putting aside the fact that there is no film sound at all (comments on dialogue are thus a tad abstract), there are a couple of loud pops, and the commentary itself is out of sync with the screen action by a good fifteen seconds, resulting in sometimes animated discussion on a shot or sequence that has not yet appeared. This is shoddy stuff, and should have been picked up on before release. The trailer sells the film rather well (not much use if no cinema shows it, of course) and is presented non-anamorphic 1.85:1, so is in the correct aspect ratio, something the main feature is not, which rather rub more salt in the wound. The photo gallery is a one minute montage of production stills set to music. To be honest they all look as if they've been grabbed from the film itself. A 1.85:1 version, no less. Film and characters is a 4 minute featurette about, well, the film and its characters. The interviews are not presented full screen, but in small windows while animated lines form boxes on screen. Hmmmm. Moran casts Malry here in a surprisingly negative light. Novel to screen is a three-and-a-half minute featurette consisting of interviews with writer Simon Bent, director Paul Tickell and lead actor Nick Moran in which they discuss the process of adapting Johnson's book for this film. The line/box style of the previous featurette is reproduced here. Soundtrack runs six minutes forty-nine seconds and discusses the creation of the music score, central to which is an interview with composer Luke Haines. As with the preceding featurettes, the presentation is a mixture of lines and boxes, but again the content is interesting. What the papers said is a collection of carefully selected short extracts from favourable reviews of the film. A somewhat odd and rather insecure inclusion, as by the time you get to this you will already have formed your own opinion of the film, and one sentence is hardly going to make you consider it in a different light. Interview with Paul Tickell is a textual extra in which the director is interviewed by Richard Marshall of 3 A.M. Magazine and discusses his approach to the film, dismissing the idea of shooting dogme-style because he'd already been down that path with his previous film Crush Proof and because "every fucker does it." He also has some interesting thoughts on British cinema in general and those working in it. There are quite a few pages to this and it makes for a worthwhile read. Finally Alternative opening sequence is just that, lasting for two minutes and really making the 4:3 cropped picture of the main feature smart by being non-anamorphic 2.35:1. There is no sound on this sequence. Several years ago, when a misguided attempt was made to revive the old TV music review show Juke Box Jury, singer Siouxsie Sioux was asked to pass comment on an innofensive but somewhat banal new single and memorably complained that: "It's not dangerous, and so in a way, it is." This nicely sums up a depressingly high percentage of recent British cinema. It's nice to be entertained, but art, great art, should definitely be dangerous. Christie Malry's Own Double-Entry may, thanks to some clunky moments and some misjudged wanderings from the source novel, fall some way short of being great cinema, but it is technically accomplished, imaginative and bold. And yes, in a time when viewpoints are narrowing and terrorist paranoia is rife, it is dangerous. And that is something to celebrate. As for the DVD, well the film deserves better. At a time when anamorphic widescreen transfers are almost a given, what the hell are we doing with this 4:3 cropped print? The extras are rather good, but even here there are signs of shoddiness. But with the film still struggling to find a large audience, a re-release is unlikely, and it can be picked up very cheaply. So check it out – flawed Outsider Cinema is still a damned sight better than most of the more polished mainstream fare out there.